Pediatric standers are simply what the name implies. 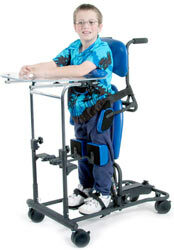 They enable a child who is not able to stand on their own to be positioned in a standing posture. The child must be able to weight bear on their legs without any significant pain, discomfort or injury. Standers are not mobility devices and do not have any function beyond allowing a child to stand for physical or psychological therapeutic value and certain activities. Many people enjoy psychological benefits in addition to the physical benefits achieved by being able to stand for short periods of time through out the day such as improved self-esteem and social development. Standers come in several forms and designs but have common characteristics. They will all have some sort of foot board of foot plates, knee blocks or straps to prevent the knees from bending, they have some sort of waist strap or support to keep the hips in position. Without securing the feet, hips and waist the child can not stand securely or safely. Back supports are available on some standers to provide the child with upper body stability and mounting positions for other options. Trays are available for some standers which can give the child a surface for activities while in the stander and added support while standing. Lateral supports can be added to some standers to keep the child centered while in the stander. Head rests can be installed for added head support if needed. Many standing frames have wheels with brakes but these are for moving the stander and not to provide independent mobility for the child. Some standers also feature a dynamic lift function. The child is loaded onto the seat of the stander in a seated position and raised into a standing position. This makes loading the stander easier for bigger kids. 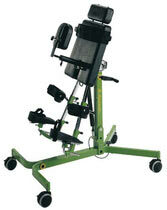 Other stander styles are positioned horizontal for loading and then stood upright. Children who have a stand up lift or a gait trainer probably have no need for a stander as these products will also function as a stander in their own ways.